Go to the Contact page and send me a message with the name of the painting you chose, as well the destination of your country. I will respond to your message within 24 hours. Order or create a custom order from your favorite photo, painting, or portrait. The portraits can be painted in oil, acrylic or pastel realized, charcoal, graphite pencil. 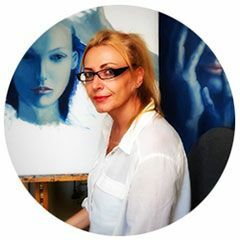 The price of a painted portrait differs depending on size, number of characters, the used manner (realistic, surrealist …) and technique (oil, pastel, pencil) and varies between 50 and 350 E / character. My paintings are completely hand-painted, absolutely no printing, 100% original craftsmanship, starting from a blank canvas. Advance order for custom paintings is charged 30% of the final price of the project. Delivered with specialized transport companies or, in special cases, by personal courier. Payment for acquired artwork can be done by bank transfer in euro, or through PayPal.